This book examines gender and the dynamics of social change in contemporary Iran, documenting the changes in women's lives and showing how women have now become agents of social change rather than victims. Bringing together the detailed primary research of a number of eminent scholars working in Iran, this collection provides unique perspectives on the past decade in Iranian society. Chapters document and examine how different Iranian groups and classes are negotiating, resisting, and pressing for political and social change, to explore the complexity of a society that often is portrayed in monolithic stereotypes in the international media. Thematically arranged sections explore discourses around gender and the impact of these discourses on women; the gendered impact of educational, employment, communications, and cultural changes; changing gender attitudes among the post-revolutionary generation of youth; and the ways economic changes have been affecting women. 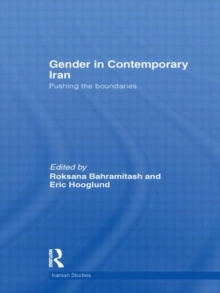 Providing an important basis for understanding social and political developments in a country that has been a focus of international attention for much of the last decade, this collection will be an important reference for scholars of Iranian studies, gender studies, political science and sociology.